David W. Lipcon was hired by a 42 year old man (“SR”) who was stopped at a red light, on a motor scooter. He was waiting for the light to turn, when his scooter was struck from behind by a driver working for a Private Transportation Company. Upon impact, SR was thrown from the scooter, injuring himself. The driver of the van, never got out of his vehicle to check on SR, never called for help, and never provided any assistance whatsoever. SR suffered severe trauma to his head, neck and back as a result of the crash. The insurance company for the van refused to negotiate a fair settlement claiming that SR didn’t sustained the injuries he was claiming. Mr. Lipcon filed a lawsuit on behalf of SR. The case was litigated for thirteen (13) months. After the first day of trial, the insurance company finally admitted liability and offered to tender all of the insurance limits available. 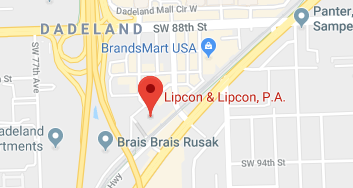 Lipcon achieved a significant result for SR that will allow him to pay his medical bills, his future medical bills and compensate him for all his current and future pain and suffering.